A magical evening awaits you in Brooklyn at the BAM Fisher. 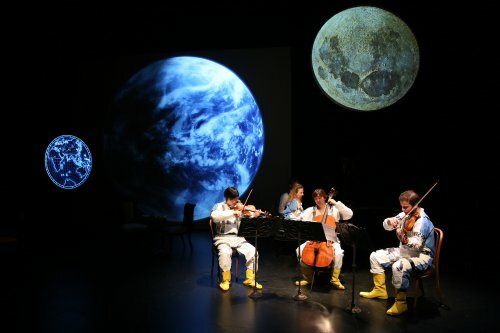 Ensemble for the Romantic Century, which presents theatrical concerts of multimedia evenings that put 19th century chamber music in an historical and literary context, is offering its own take on Jules Verne: From the Earth to the Moon. 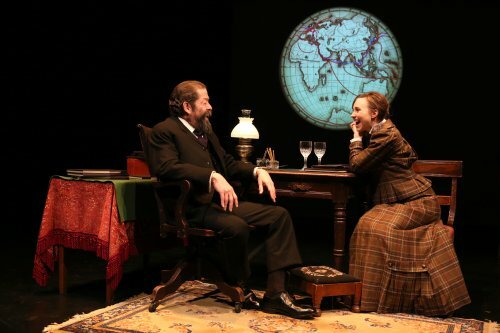 It dramatizes the story of Verne’s fascination with travel and space and his meeting at his home in Amiens in 1889 with American reporter Nellie Bly who beat the record of his Phileas Fogg by going around the world in 72 days. ERC’s unusual evening includes music by Ernest Chausson, Cécile Chaminade and Jacques Offenbach, video taken from George Méliès’ silent film A Trip to the Moon and the Apollo rocket launch and moon landing, and choral singing of songs by Stephen Foster. 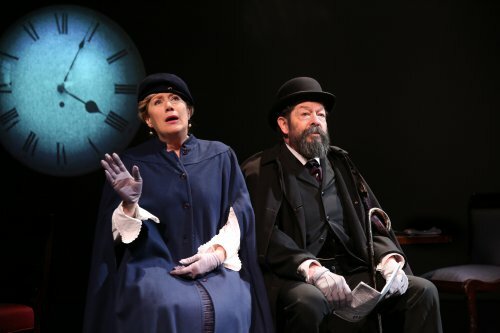 Co-artistic director Eve Wolf’s text which makes up the theatrical parts of the evening is based on letters, interviews and memoirs and presents Jonathan Hadary as Jules Verne, Jayne Atkinson as his wife Honorine, and Samantha Hill as intrepid American reporter Nellie Bly. A heady evening of fascinating treasures. The evening begins with a prologue in which Verne is composing his novel From the Earth to the Moon. Addressing the audience as in an interview, he tells us, “I would like to leave in my work descriptions of all the surfaces of the globe. That is, to describe the whole earth in my novels – that is my plan – but the world is not enough for me … it is the universe I want to see…outer space…stars.” We discover that since an accidental shooting by his deranged nephew, Verne has not been able to travel for the past four years and has had to rely on books for his descriptions of his exotic locales on earth. After we hear Stephen Foster’s song, “Nellie Bly,” which gave the editor of her first newspaper the pseudonym for the reporter at a time when women journalists did not use their own names, Bly tells us that in trying to come up with an idea for a newspaper article, she thought, “I wish I were at the other end of the earth!” This led to her proposal to beat Verne’s Phileas Fogg’s record and attempt to go around the world in under 80 days. When Verne’s wife Honorine hears of Bly’s plans from a newspaper account, she exclaims that as a woman traveling alone she would need so much luggage as to make the trip impossible. The first half ends with Bly on the verge of her sea voyage that will take her 28,000 miles and to her celebrated meeting with Verne. In the second half of the evening, Bly disembarks from the S.S. Augusta Victoria in Southampton and heads for France and a meeting with the Vernes at their home in Amiens on Nov. 23, 1889. He shows her his maps, she asks to see his study. He regrets that he has traveled so little, never having traveled beyond the Channel and the Mediterranean, and wishes he could accompany her on her journey. Bly and Verne sing the duet “Valse chantée,” from Offenbach’s operetta based on Verne’s novel, From the Earth to the Moon. Bly can only stay a short time before catching her train to Calais to meet her ship to Brindisi or she will lose a week. Ultimately, we are told Bly beats Fogg’s record and Verne sends congratulations. He tells us that he has already written 74 novels by writing five hours every morning and hopes to write many more. In the end, Verne returns to his novel about travel to outer space, as we see the first landing on the moon in two ways, in Méliès’ 1902 animated film version and footage of the Apollo 11 landing on July 20, 1969, very much like Verne’s description in his 1865 novel. Hadary makes the 61-year-old Verne a crotchety old man without a sense of humor which may be historically accurate but seems very one note. As his wife of 32 years and in a comfortable routine of domesticity, Atkinson (who has recently played the Secretary of State on Netflix’s House of Cards) is both witty and facetious. Samantha Hill, currently starring as Cosette in Les Miserables on Broadway, is charming as Nellie Bly as she sings, acts, and dances, proving that she has a lovely soprano. She is occasionally accompanied in her singing and dancing by tall dashing Andrew Howard who does double duty miming her editor, acting as Wolf’s page turner, and singing the American songs as a member of the vocal quartet which also includes Brian J. Gay, Matt MaGrath and Keaton Williams. The video montage by David Bengali and the lighting design by Beverly Emmons gave the evening an otherworldly feeling. The video includes scenes of stars, galaxies and the sea while the music is playing, scenes from Méliès’ A Trip to the Moon, documentary footage of the 19th century events including an ocean liner voyage, maps and the front pages of international newspapers with headlines about Bly’s trip around the world, and footage of the early days of the American space program. Aside from the large screen on the back wall of the stage, Vanessa James’ set design includes two round discs, a large one behind Verne’s study, often used for maps and charts as well as stars and the moon, and a smaller one above the musicians on the opposite side of the stage that is used exclusively for astronomical depictions. James is also responsible for the period-perfect costumes of the historic characters and the witty space suits for the musicians in the second half of the evening. Tymberly Canale’s choreography attractively recreates the dances of the 19th century. The entire evening was directed by Donald T. Sanders who kept the feeling of both a theatrical and musical adventure. Ensemble of the Romantic Century’s Jules Verne: From the Earth to the Moon is an unusual evening. Offering music, dance, video and theater, it works on all four levels while at the same time being a mind-expanding vision of one man who could think up the future. The limited run of only five performances does not offer enough time for all those who would enjoy seeing it. The first of Birbiglia’s solo shows to reach Broadway finds fresh laughter in the old “impending fatherhood jitters” theme.